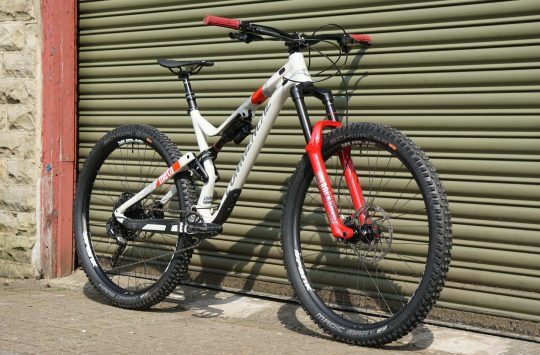 When the bike first arrived, aside from being blown away with just how damn good the bare aluminium with orange and black graphics looked, I was puzzled; Commencal Meta TR 4.2 Race. Race. What sort of race? XC race? Nah, can’t be – it’s got too much travel for that. Enduro Race? Nope. Not enough travel, and those tyres aren’t anywhere near aggressive enough. DH Race then? Err, no. For trails, or racing, or both? Back when the Lake District resembled North American savannah. So what does it mean? 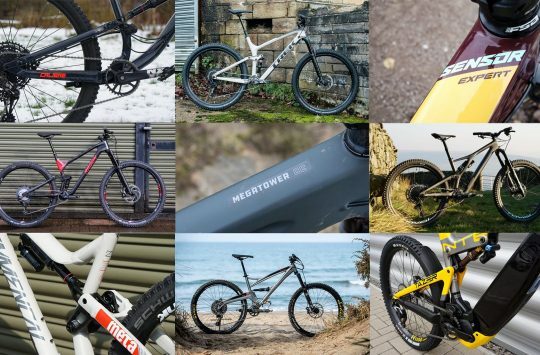 One quick email to Commencal later, and all becomes clear – it’s the naming strategy of the brand – from most basic to most tricked out, you get Origin, Essential, Race and finally World Cup at the blinged out top end of the tree (NB. the Meta TR range tops out at Race, so this is the pinnacle of this particular branch). Ultimately, what this means to you dear reader, is that this Meta TR 4.2 Race features full Fox Factory suspension front and rear, a 12-Speed SRAM GX Eagle groupset, 2-pot Shimano XT brakes, a rather lovely and VERY loud e*13 wheelset, Maxxis Forekaster and Minion SS (that’s semi slick, not secret service) tyres, and a host of own brand Ride Alpha finishing kit including bars, stem, and grips. 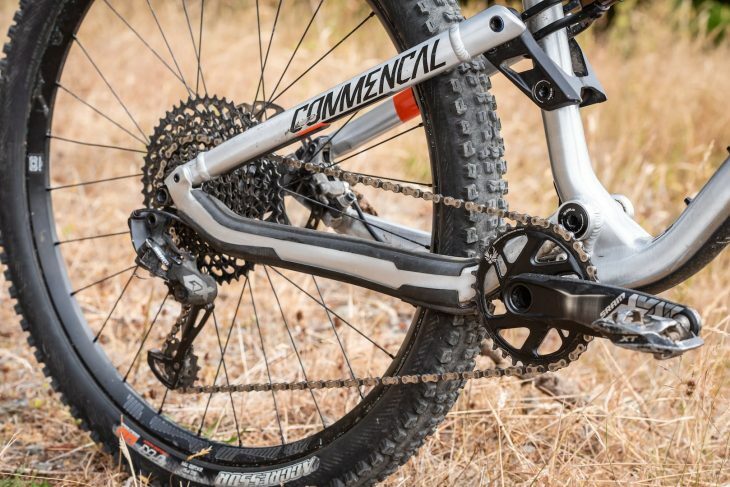 Money has been spent where it makes a difference (suspension and wheels), while keeping the overall cost relatively low at £3,400, aided by the direct sale only nature of Commencal. Constructed entirely from aluminium with a single pivot linkage driven shock, the Meta is relatively simple in today’s complex world of VPP, carbon wunderbikes. The frame (in its current guise) has been around since 2016 and not a great deal has changed; the huge top tube is still flattened and heavily shaped, but is now a 2 piece construction, rather than the previous 3 piece affair. It still has loads of standover clearance, and the (now metric) shock is still tucked neatly underneath it, half in, half out, leaving plenty of room for a water bottle within the main frame. 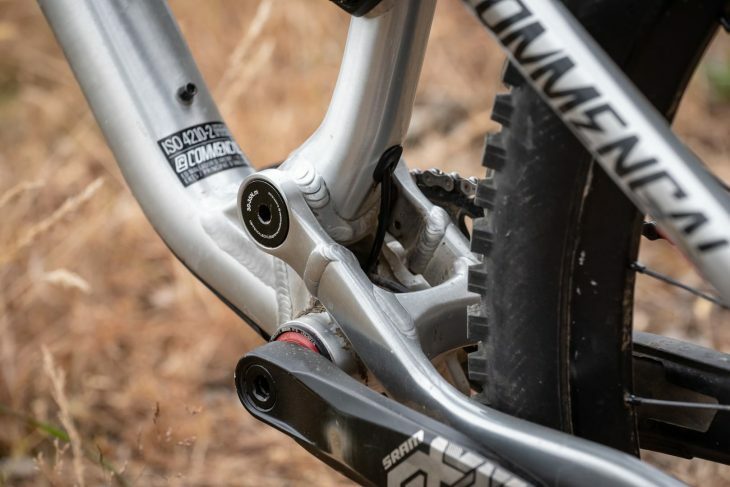 Alongside the addition of a metric shock, the rear travel has also increased to 130mm. 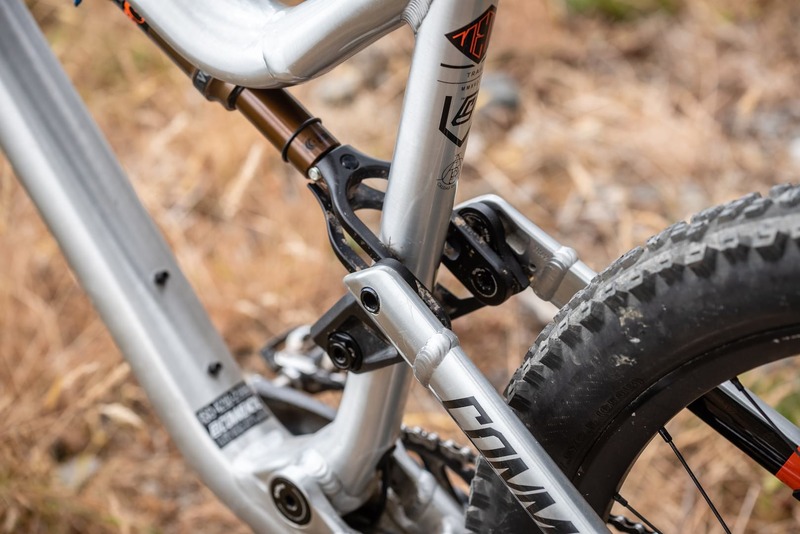 The main pivot hasn’t moved though, and isn’t quite in line with the 34t X-sync chainring, being slightly up and forward, and this gives the Meta a taut pedalling platform that rarely calls for the shock lockout to be used. 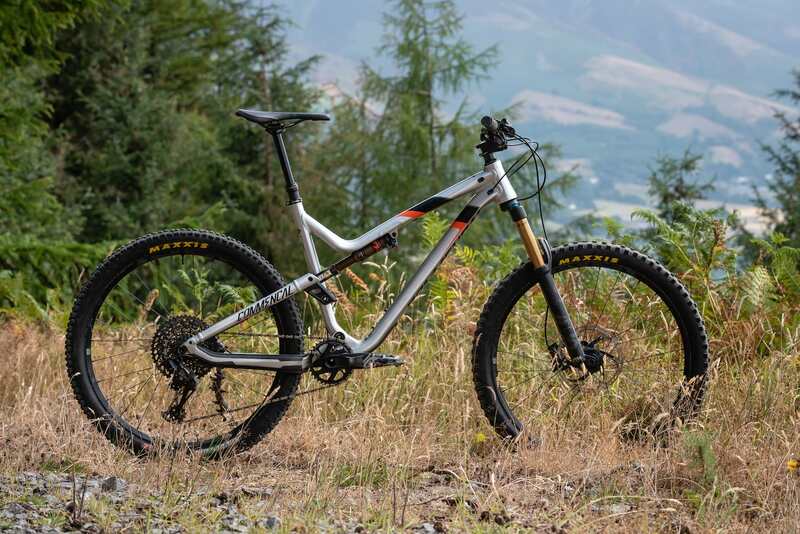 The frame is 1x specific, which means Commencal can seriously beef up the area around the main pivot – there’s a lot of metal there, which should aid longevity of the frame albeit at the expense of weight – in spite of the relatively short travel and chi-chi specification, the bike still weighs in at a fairly portly 13.4kg (without pedals, with a little bit of mud), and with decent tyres and pedals that figure climbs to well over 14kg. Not a carbon floaty light machine. Vital stats for this size large are as follows – head angle 66.5°, seat angle 74°, reach 460mm, and it fits perfectly for me at a shade over 6ft. 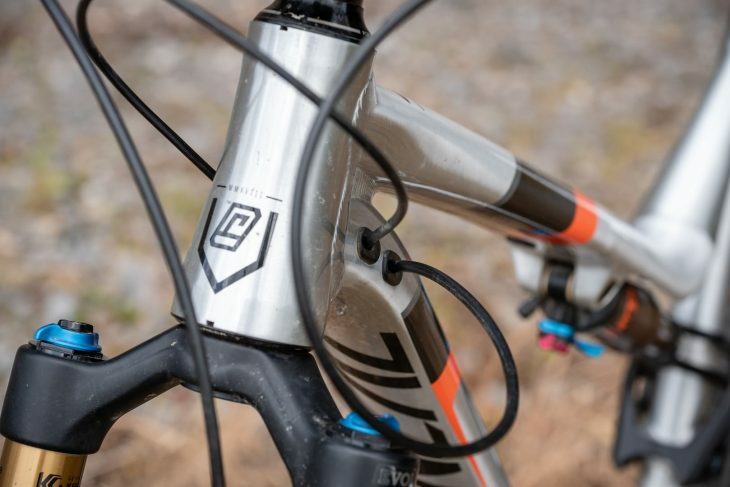 The chainstays are relatively short at 437mm, yet there’s loads of tyre clearance, and Commencal has tucked the rear brake caliper inside the stays. It looks super neat, but it does mean that the chainstays are quite wide, right about where the heel of your shoe hits them, and it makes changing brake pads a little trickier too. The drive side chainstay has a big fat rubber pad running the length of it, which dampens chain slap very effectively and keeps things nice and quiet. Cables are routed internally, and there’s a spare slot for a shock lockout cable should you choose to fit one. 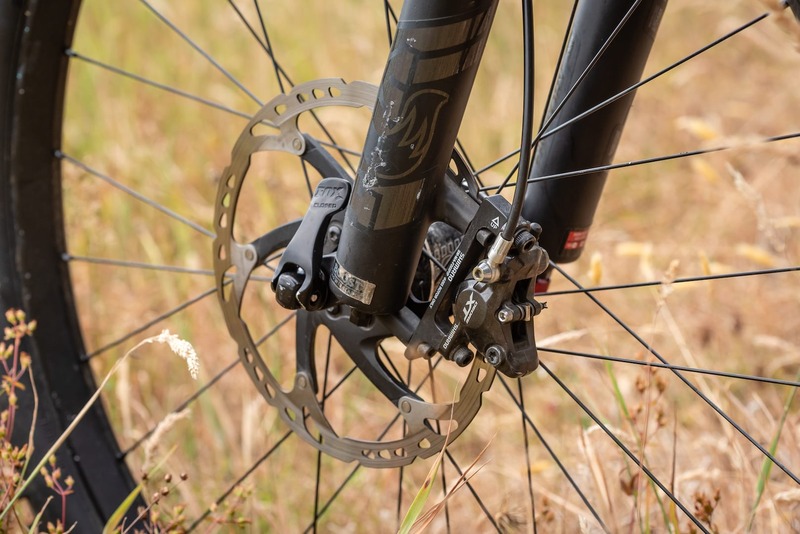 Diving into the components in more detail and the 2-pot Shimano XT brakes provide plenty of power and modulation, but soon started to suffer from the common problem of a variable bite point that seems to be plaguing the M8000 range. Changing pads briefly alleviated the issue, but it soon returned, which is a shame. Meanwhile, shifting duties are handled by SRAM GX Eagle and the 10-50t cassette is very welcome in the Lakes, I just wish that manufacturers would spec a 32t chainring rather than upping it to a 34t – I run out of climbing legs long before I need a higher top gear! Oh, and while there are ISCG tabs for a bash guard and chain guide, I didn’t drop the chain once. A 32t ring would have been welcome. It’s a taut pedalling platform. As this is the top of the range Meta TR, we get Fox Factory suspension front and rear. Up front is a set of 34 Floats with 140mm travel and the excellent FiT4 damper, while out back we get a Float DPS shock that gives 130mm travel. Both units are Kashima coated and are slippery smooth, eating up pretty much everything I could throw at them, remaining composed throughout the test period. It was only on the repeated square edged hits of Dollywagon Pike and Birkside off the summit off Helvellyn that the damping started to get a little bit overwhelmed, and I could have done with more travel and some beefier stanchions. But then again, the Meta TR only has 140/130mm travel and if you’re regularly attacking those sort of trails then maybe the Meta AM would be a better bike for you. The e*13 TRS wheelset is brilliant, came set up tubeless, and has stood up to my shoddy line choices with aplomb. The rims are nice and wide (30mm internal), providing a stable platform for tyres up to 2.5in wide. And as an added benefit, the freehub is one of the loudest I’ve ever ridden, serving as a useful warning when coming up on unsuspecting walkers. Eagle – sensitive to mech alignment set up. Onto tyres, and the stock Maxxis Forekaster is fast rolling and provides ample grip for trail centre riding, while the Minion SS is a great rear tyre for these drier, dustier conditions we’ve been enjoying recently. But due to the light casing on both tyres, I wasn’t able to truly push the bike on the steep, technical riding it encourages. At roughly 750g each, the tyres help keep the total weight of the bike down and it accelerates quickly, but I couldn’t help feel that they were holding things back for fear of puncturing and lack of outright grip. Fortunately, I’ve had a brace of Maxxis Double Down ‘Wide Trail’ tyres to test, and with either a Shorty or Minion DHR 2 paired with an Aggressor out back, the Meta has been transformed into a BikePark Wales shredding, Helvellyn summit smashing, Lake District conquering weapon. Yes, the weight of the bike has gone up by nearly a whole kilogram, but the tyres have added stability and confidence, which far outweigh the negatives for my riding style. Obviously, if your day to day riding doesn’t call for such heavy duty tyres then that’s totally fine and you’ll probably be ok with the stock tyres. 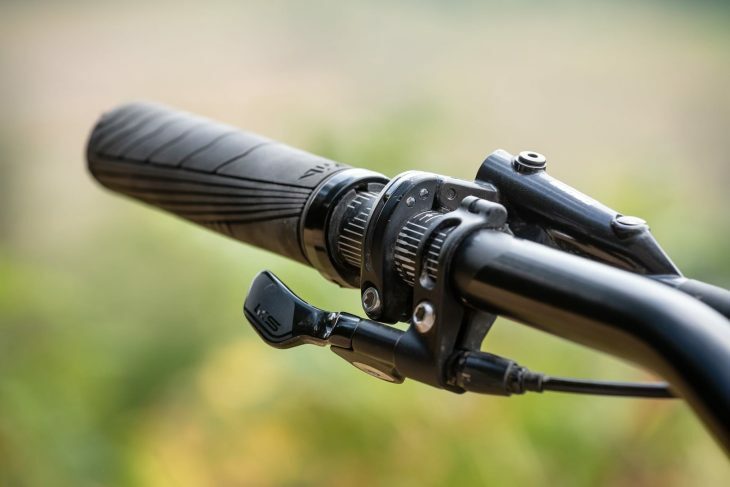 The Ride Alpha finishing kit of bars, stem, grips and saddle are super comfy, although you might question why you’re only getting own brand kit at this price. It’s a valid point, as other brands manage to spec named parts, but in all honesty it wasn’t an issue; it all works, I had zero issues with any of it, and it doesn’t look like own brand kit. 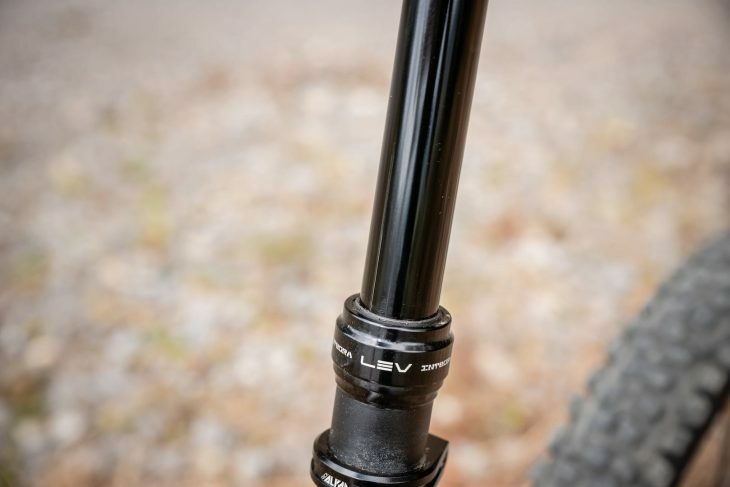 A KS Lev Integra dropper post (with Southpaw Lever) rounds things off, and the 150mm drop is perfect for getting the saddle out of the way on the steeps. I intentionally spent most of my time riding the Meta TR without paying too much attention to the geometry figures. 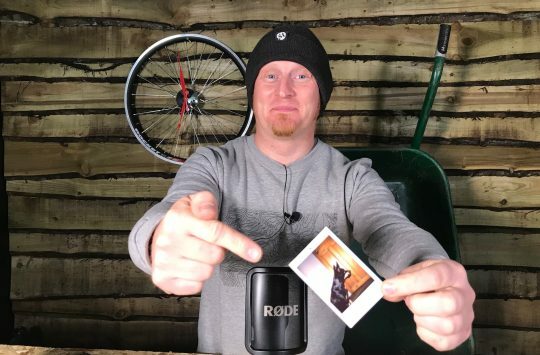 And by that, I mean I only went and looked them up while writing this review – when the bike arrived, I took it out of its box, bolted the bars on and went riding. 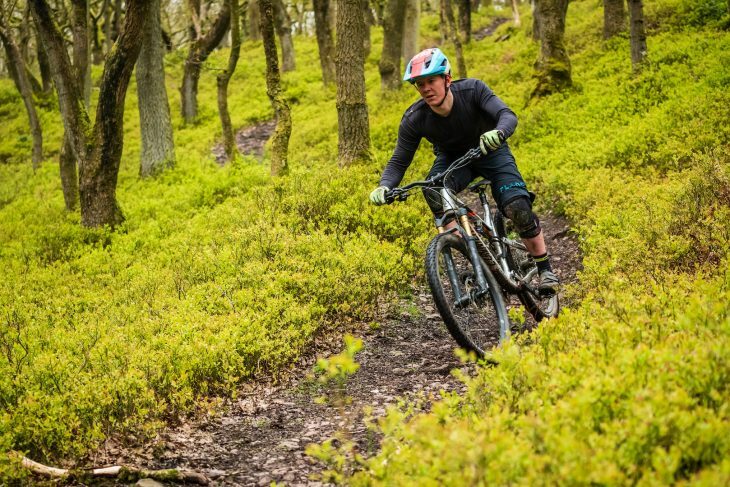 Living near the Lake District, most of the riding I do is on steep, rocky trails, with occasional forays on to loamy off piste tracks through the woods. And the Meta TR was perfect. 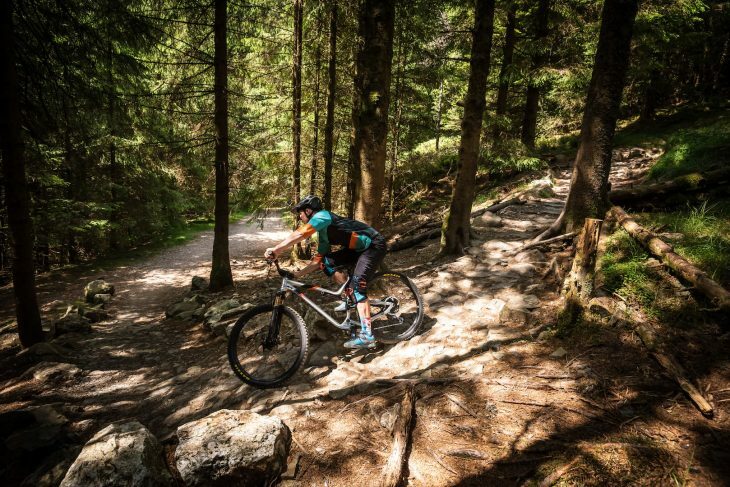 The high-rise bars put you in a commanding position for attacking all manner of technical trails that a bike of this travel has no right in being so good on. On the great A470 jump line at BikePark Wales, the Commencal was exceptionally agile and confidence inspiring – I’m not a natural jumper, preferring to keep my wheels on the ground, but I found I was able to throw it around in the air with ease. 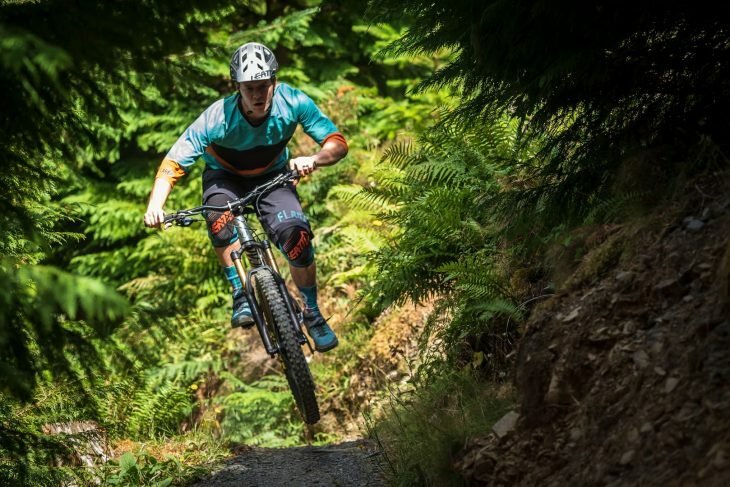 In fact, I felt much more comfortable on the Meta than I did when I returned to BikePark Wales a few weeks later for a product launch. On a Whyte S-150 that on the face of it was much more suited to the tracks there, I felt awkward and wasn’t riding very well at all. 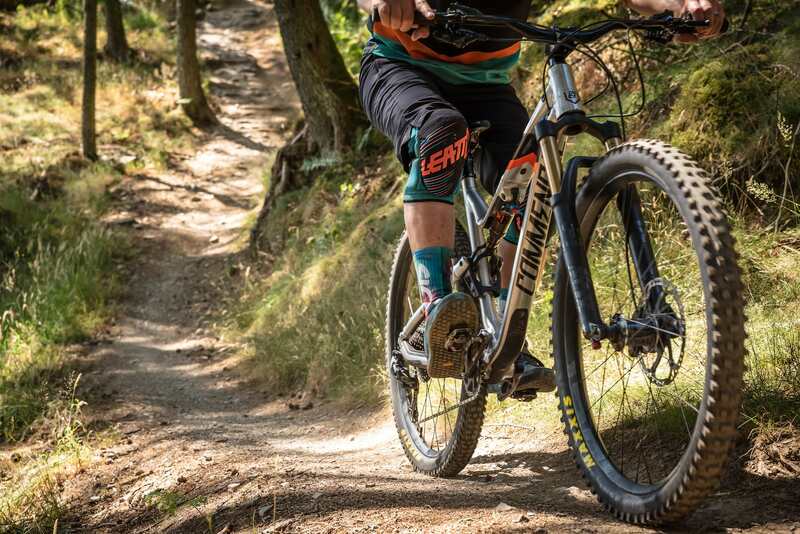 In spite of its weight the Meta climbs and pedals very well and, because of its playful nature, encourages you to be active, searching out features to pop off and pump for extra speed, rather than just sitting down and plodding along as a passenger. Take it to a trail centre, and it’s an absolute hoot, picking up and maintaining as much speed as you can handle. Pedals well and is playful. No stopping for bilberries when you’re having fun. The Meta only starts to get overwhelmed on really gnarly terrain, with repeated square edged hits, when trying to keep up with riders on much bigger bikes (think 150/160mm travel). It’s at this point that you wish for a bigger fork and some more controlled damping, but you’ve been having so much fun everywhere else it isn’t too much of an issue. Are there any negatives to this dream machine? Well, the seat stays are wide. Like, really wide. Because of the rear brake caliper placement, I sometimes found my feet catching, especially with Giro Terraduros (size 43). However, the chunkier Giro Chamber 2 shoes that I switched to recently have a more inboard cleat placement which conversely moved my feet out, and this has solved the issue. But be warned – if you run your cleats slightly further forward or your feet are much larger than a size 44, chances are, you’re going to catch your heels against the stays. Another slight issue with the frame is that one of the bolts on the non drive side rocker worked its way loose. Again, it’s not a big deal, but because of the placement of the bolt I had to strip the bike down to get a hex key in to tighten it all up. This did get a bit waggly. Brakes were a bit variable over time. There are a couple of minor component niggles too – the KS Lev dropper post has developed a significant amount of play and there is some wear appearing on the shaft. It’s not the end of the world, but it is noticeable and is mildly distracting when seated. On to the shifting, and SRAM Eagle has yet again proved itself incredibly sensitive to mech alignment – I’ve caught the rear mech a couple of times, knocking it out of true, and the shifting has never quite recovered. The huge spread of gears is appreciated when climbing, but I’m really not a fan of how fussy it is – give me a gearbox equipped bike any day. Finally, and most significantly, the bike has got quite noisy towards the end of my time with it. I’ve tried to track it down, but can’t pinpoint the creak beyond either the press fit bottom bracket or the pivots. I’m hoping it’s all this dry weather we’ve been having, and that a bit of rain will sort it all out. Other than this, I don’t really have any complaints at all, and quite frankly they’re inconsequential and don’t detract from what is an utterly brilliant, and ridiculously fun bike to ride. James waves a sad goodbye to this bike. It got pretty noisy towards the end of the test, and I couldn’t pinpoint the creaks beyond the bottom bracket or pivots. 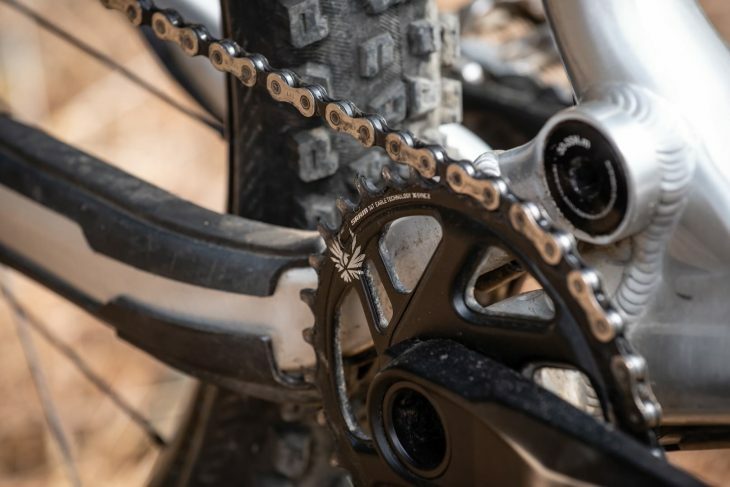 The GX Eagle drivetrain is very sensitive to mech alignment for a mountain bike that gets ridden in the rough stuff. The stock tyres – this bike is really hampered with the stock lightweight tyres and its potential is unleashed simply by fitting beefier rubber. 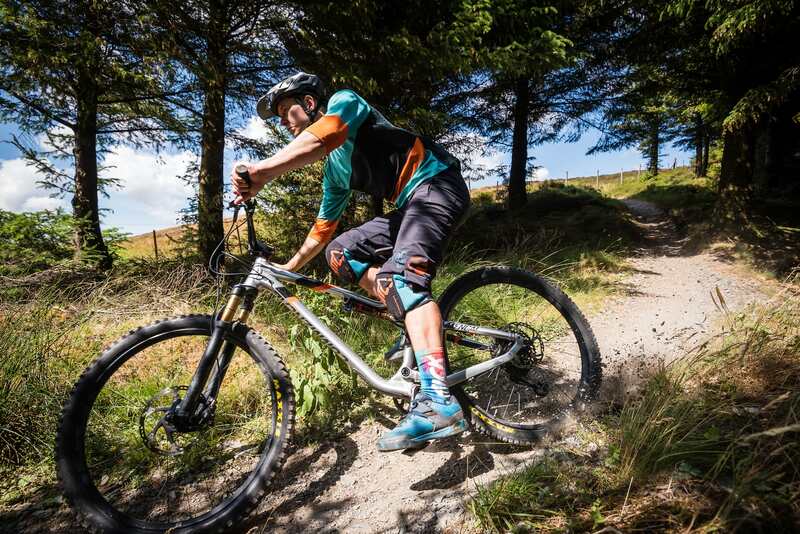 The geometry – it’s just a great riding position, that’s really fun, stable and confidence inspiring. That raw finish with black and orange graphics – this is one of the nicest looking bikes I’ve ever laid my eyes on. 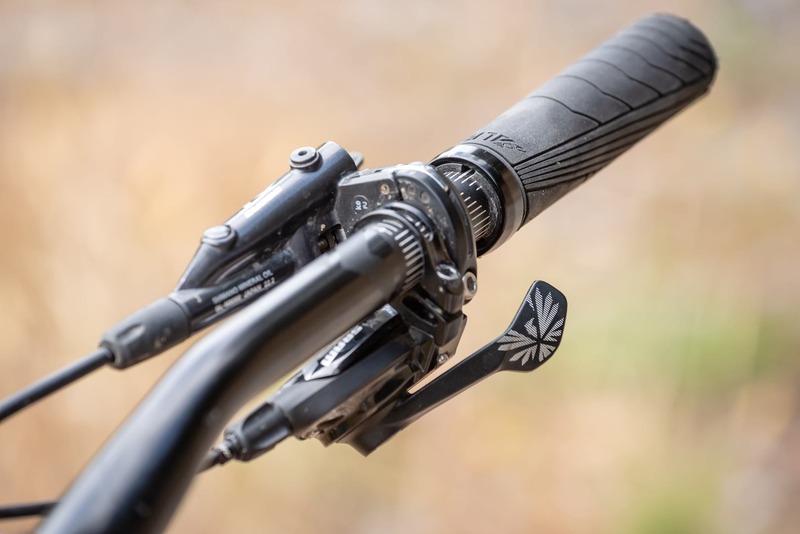 The components – nothing on this bike is out of place, even (Commencal own brand) Ride Alpha’s bars, grips, stem and saddle are more than up to the job, and money has been spent where it’s most needed. 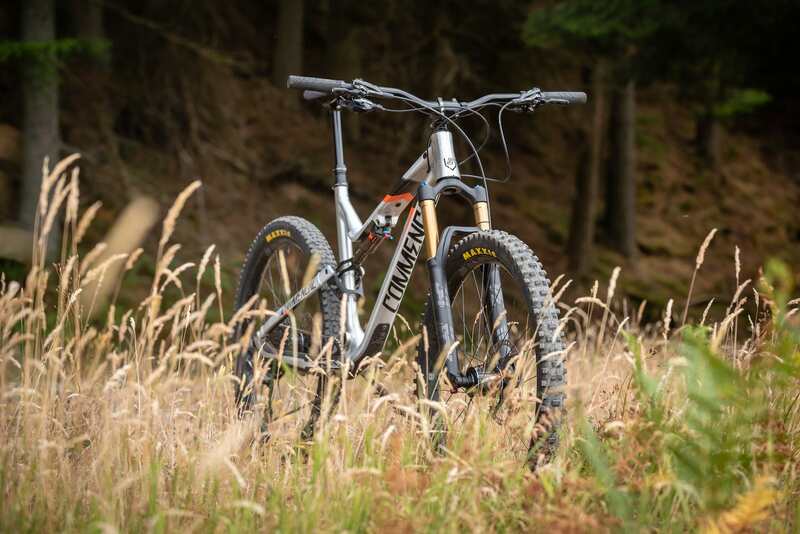 The Commencal Meta TR 4.2 Race, is quite simply one of the most fun, most confidence inspiring bikes I’ve ever had the pleasure of riding. 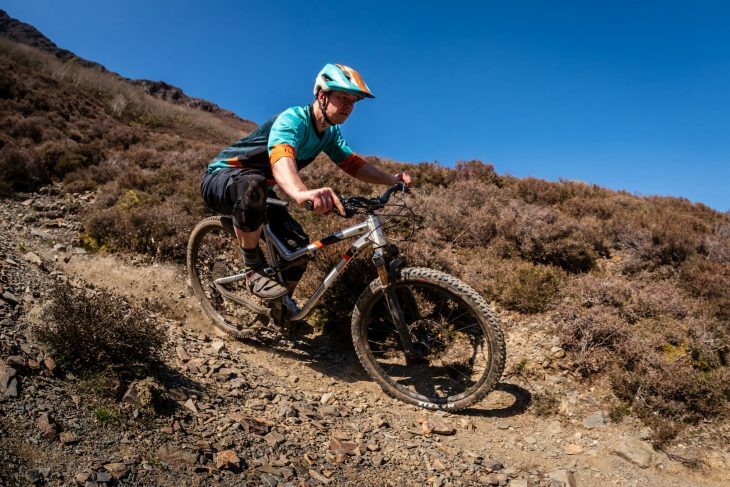 It may not have as much outright speed as a longer travel enduro race bike, nor be as spritely up hill as a XC bike, but what it lacks in speed, it makes up for in playfulness and agility. For day to day riding, whether that’s cruising round a trail centre or hoofing it up a Lakeland pass, it’s an absolute hoot, and I was absolutely gutted to say goodbye to it. I noticed you posted a video at the end, but it’s not available. Any chance of you reposting it? Would really love to see some footage of the bike in action. And to also hear that loud hub! I’m so glad another review came out for this bike, the only other one I’ve seen is from Lone Wolf. But both reviews have been great, with only minimal issues that I feel could be resolved fairly easily. To be honest, on my hunt for my next bike, I couldn’t seem to find a bike with similar components at this price range. Like you mentioned, I could get a discount Whyte, but it seems like you weren’t much of a fan and there’s not much said about them. I’m actually looking to purchase it now for my birthday this month. I see a lot of people talking about the issues with the wide stays, but I feel like I should be okay, considering my foot size is a 42 (US 9) and I ride clipped in.